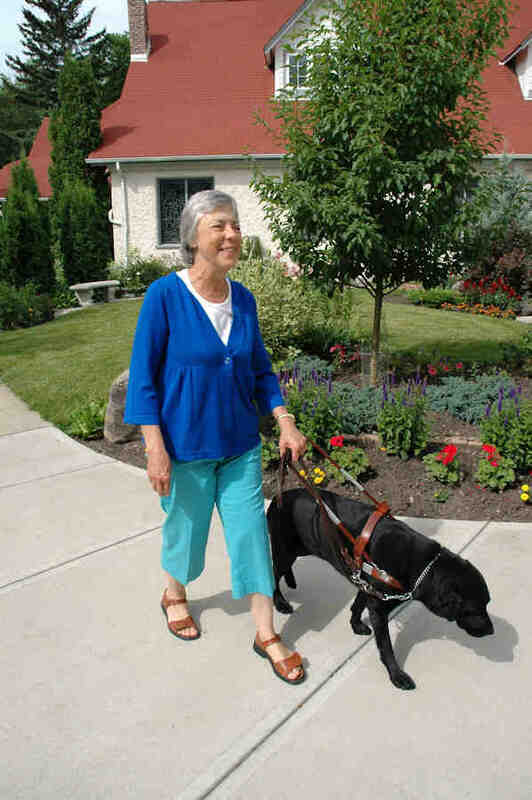 Senior lady walking on a sidewalk in front of a house with her guide dog (black Labrador). Many people impacted by blindness use guide dogs to aid in their mobility. A “working” guide dog is equipped with a harness that the handler grasps. When a guide dog is not working, the handler will usually release the harness and control the dog with a leash. Unlike the long white cane, which is used to detect obstacles, guide dogs work in partnership with their handlers to react to obstacles. Once trained, guide dogs learn to stop at elevation changes and lead their handlers around dangerous areas (e.g., construction sites) and away from overhanging protrusions. The handler is always in charge and gives directions to the dog (e.g., “turn right,” “turn left,” etc.). In Canada, provincial legislation permits people who use guide dogs to enter or use any public space. In terms of the built environment, dedicated guide dog relief areas or other grassy areas should be made available wherever possible for people who use guide dogs. Please see the Maintenance section for more on this topic.